1) The Sox broke out from a mammoth 10 year basing formation to end its secular bear market (SBM) decline early 2014 at about the 1/3 SBM retrace level. 2) The initial breakout thrust briskly took the index to over the .382 SBM retrace level. It then double topped and mini crashed to its original breakout pivot point. Lets call this the ST test from above of the SBM breakout. 3) The next rally off last October bottom, like the broader market was also sharp and carried the Sox close to the .50 SBM retrace level, a critical hurdle it needs to jump over to assert itself as a new secular bull market. Failure begets many doubts and predictably the reaction was swift and sharp and threw the index back again to its original breakout pivot point. Lets call this the LT test from above of the SBM breakout. 4) The support is immense right here. 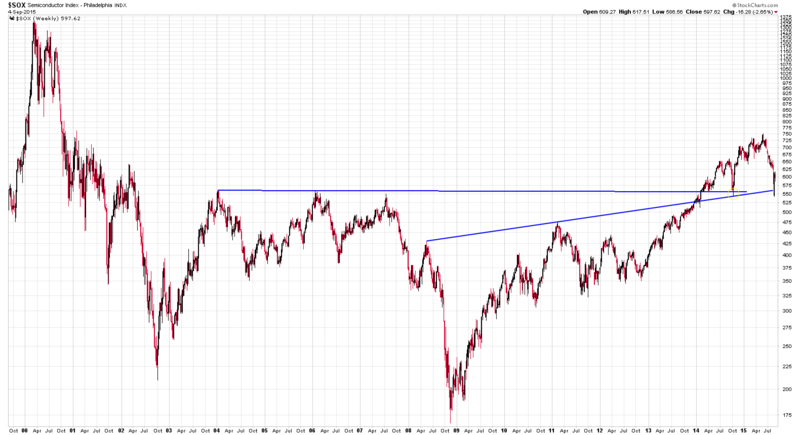 Notice the crosshair convergence of the long term trendlines on the chart. It's also approximately the .5 retrace level off the 11/16/12 bottom to its most recent swing highs. 5) Long term breakouts such as the one the SOX experienced a year and a half ago often go through short term and a long term snapback tests and this year and a half mess fits the bill to a T.